Samsung, the Korean giant, has started to roll out a major software update for its Galaxy Note 4 users in the Malaysia. 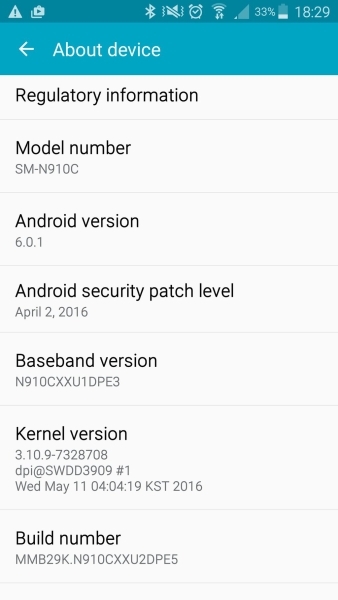 The phablets users in the country are getting Android 6.0.1 Marshmallow based TouchWiz UI updates as the company has finished with a final build. It has been in a long waiting, but the brand has done it. Apart from the tweak in the interface look and feel, there are features like Now on Tap and Doze that would be available for the 5.7-inch screen device owners. You also get a security patch for the month of April, which is something Google has recently started to roll out every month and brands are following to keep its users protected. If you’re unfamiliar with these features, let us give you brief explanation. What Now on Tap does is that it scans everything on your screen and provides you with the relevant content and search results, all you got to do is tap on that word or phrase. While Doze mode is an advanced battery saving mode that keeps the smartphone in a low-power state when the owner is not using it. This dramatically reduces the power consumption, thus improving the battery life. You can also expect the latest build to be quite faster and snappier in performance than ever, as Marshmallow has some performance improvements over the Lollipop OS. The model SM –N910C, which is the Malaysian variant of the Note 4, sees a build number jump to MMB29K.N910CXXU2DPE5. Now if you haven’t received the OTA update yet, then we you can surely head over to the About device section in the Settings app. There you’ll find an option Download updates manually. Note that we recommend you download this file over a stable Wi-Fi connection since it’s a large sized file. Unless you have a stable mobile data pack, which hasn’t reached the FUP. The choice is yours! In related news, Samsung recently updated firmware on their 2016 flagship devices, which are Galaxy S7 and S7 Edge. Moreover, have you read that the South Korean was the only mobile brand that saw an increase in revenue for the Q1 2016.